Salmon and tilapia are the face of high-protein seafood options, yet several other seafood choices offer even more protein. Start eating these 3 high-protein swimmers today! If seafood is on your menu, it's probably a beautiful pink piece of seared salmon or a flaky piece of tilapia. But did you know there are three delicious, readily available seafood options even higher in protein per bite? Break out of your seafood rut, and try one of these high-protein options today! This is not your average canned tuna. Yellowfin tuna is a premium option, with such a large amount of protein per serving that only specialty cans can handle it! On a serious note, yellowfin tuna provides a boatload of protein per bite. While I prefer to eat mine fresh, canned varieties make eating this fish a convenient alternative to regular albacore tuna. Need to Know: When possible, look for troll- or pole-caught tuna, which are the most sustainable options. Octopus is becoming increasingly popular, and for good reason: It's a lean source of white meat rich in protein. Yes, you will be able to find it at your local grocer, though I recommend seeking out a fishmonger instead. 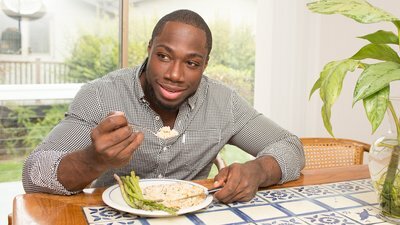 If your goal is to pack on muscle, you'd be a sucker not to reel it in for its protein windfall. Need to Know: Frozen octopus has an advantage over fresh, because the subzero process works to help tenderize the meat. Try grilling your octopus to infuse a smoky flavor that compliments this cephalopod well. If you're a fan of white, flaky fish, order halibut next time you dine out. This buttery fish is full of protein, yet remains low in fat. Among white-flesh fish species, halibut reigns supreme when it comes to the protein you need to build muscle like a champ. Each 3-ounce serving also has a mere 2 grams of fat, making halibut an even better catch of the day. Need to Know: Pacific halibut is considered a more sustainable choice than Atlantic.